Many pet stores and libraries do not have the most current resources and, therefore, do not have the most accurate hedgehog information. Unfortunately, some of the books on the market and web pages on the Internet are out of date, and contain inaccurate and even harmful information. Antigone Means-Burleson published a book titled The Hedgehog Primer. This book has all the latest and most up to date information concerning hedgehogs and hedgehog care. 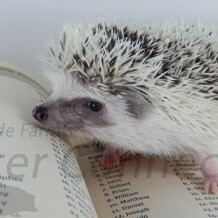 This book may be purchased directly from Hedgehog Valley or here at Millermeade Farms. My favorite book that can be found in pet stores is by Dawn Wrobel with Dr. Susan Brown: Hedgehogs: Guide to a Happy, Healthy Pet. It is a small, hardback book published by Howell House (copyright 1997). Reeve, N: Hedgehgos. T & AD Poyser, London 1997. Graesser, Donnasue. Mortality and Longevity Update! Boys vs. Girls. IHA News. September-December 2005. Miller, Lucinda. Facts You Should Know About Hedgehogs. Ohio 4-H Small Animal Hedgehog Fact Sheet. 1998. Walker’s Mammals of the World. Hoefer HL: Clinical Approach to the Pet Hedgehog. In Proceedings of the Atlantic Coast Veterinary Conference, 2001. Arnemo, J.M. ; soli N.E. : chemical immobilization of free-ranging European hedgehogs (Erinaceus europaeus). J.Zoo Wildl. Med. 26 (2): 246-251; 1995. Benenson AS, ed. Salmonellosis. In: Control of communicable diseases manual. 16th ed. Washington, DC: American Public Health Association, 1995:410-15. Brodie, E.D. III et al. : Breeding the African Hedgehog Atelerix pruneri in captivity. International Zoo Yearbook 22. the Zoological society of London, London, England 1982; pp 195-197. Boeuer WJ: Insectivora, in Wallach J, Boeuer WJ (eds): Diseases of exotic Animals, edical and Surgical Management. Philadelphia, Saunders, pp 653-662. Buergelt CD: Neoplasms in captive hedgehgs. Vet Med 96 (7): 524-527 2001. Bunnell, T. The Importance of Faecal Indices in Assessing Gastrointestinal Parasite Infestation and Bacterial Infection in the Hedehog (Erinaceus europaeus). Bunnell, T. An effective, harmless treatment for tick (Ixodes hexagonus). Bunnell, T. Susceptibility of juvenile hedgehogs to disease; some observations. deMaar, t.W. et al. : Chagas’ disease in an African Hedgehog. Proc. Am assoc. Zoo vet./Assoc. reptilian amphibian Vet., Pittsburgh, Pa., 1194’pp 151-153. Donnelly T, Nastase R. Skin Lesions in an African Hedgehog. Lab Animal Volume 29, No 7 pp 21-22. Fons, R.; thenius, e.: Insectivores. Grzimek’s encyclopedia of Mammals, Vol 1 (H.C.B. Grzimek, ed). McGraw-Hill Publishing, New York, N.Y., 1990; pp 416-519. Graczyk, T.K. et al. : fatal cryptosporidiosis in a juvenile captive African hedgehog (Atelerix albiventris). J. Parasitol. 84 (1):178-180;1998. Graesser, DS. Wobbly Hedgehog Syndrome in African Pygmy Hedgehogs (Atelerix spp.) Journal of exotic Pet Medicine Volume 15, Issue 1, January 2006, Pages 59-65. Gregory, M.W. ; stoker, L: Hedgehogs. Manual of Exotic Pets. British Small Animal Veterinary Association, Cheltenham, Gloucestershire, U.K., 1991; pp 63-68. Hamlen H: Retro-orbital blood collection in the AFrian hedgehog (Atelerix albiventris). Lab Anim July/Aug, 1997, pp34-35. Hoefer HL: Clinical Approach to the African hedgehog. Proc. North Am. Vet. Conf., Eastern States Veterinary Assoc, Gainesville, FL, 1999; pp 836-838. Hoefer HL: Hedgehogs. In Vet Clin North Am Sm Anim Pract 24 (1) pp 113-120, 1994. Hoefer HL: Hedgehogs. Small Anim Pract 24:113-120, 1994. Hoyt R: A review of the husbandry ad reproduction of the African hedgehog (Atelerix albiventris). Proc American Assoc of Zoological Parks and Aquariums. Minneapolis, 1986, pp 85-95. Johnson-Delaney CA: Hedgehogs, in Johnson-Delaney CA (ed): Exotic Companion Medicine Handbook. Wingers Publishing. Lake Worth, Fla, 1996, pp1-14. Keymer, I.F. et al. : zoonoses and other findings in hedgehogs (Erinaceus europaeus): A survey of mortality and review of the literature. Vet. Rec. 128 (11): 245-249, 1991. Larsen RS, Carpenter JW: Husbandry and medical management of African hedgehogs. Vet Med 94 (10): 877-888, 1999. Meyer, D.J. et al. : appendix: Normal values and conversion tables. Veterinary Laboratory Medicine: Interepreation and Diagnostics. W.B. Saunders, Philadelphia, Pa., 1992; pp 3237-336. Ness RD: Clinical pathology and sample collection of exotic small mammals. Vet Clin North Am: Exotic Anim Pract 2(3):591-620. 1999. Palmer, A.C. et al. : Paralysis in hedgehogs (Erinaceus europaeus) associated with demyelination. Vet. Rec. 143 143 (20):550-552;1998. Philpot, C.M. ; Bowen, R.G. : Hazards from hedgehogs: Two case reports with a survey of the epidemiology of hedgehog ringworm. Clin. Exp. Dermatol. 17 (3):156-158: 1992. Raymond JT, Garner MM: Spontaneous tumors in captive African hedgehos (Aterlerix albiventris): A retrospective study. J Comp Pathol 124(2-3):128-132, 2001. Raymond JT, White MR: Necropsy and histopathologic findings in 14 African hedgehogs (Atelerix albiventris); A retrospective study. J Zoo Wild Med 30(2):273-277. 1999. Reeve N: Hedgehos. London, T & AD Poyser, 1994, pp 214-225. Smith AJ: Husbandry and medicine of African hedgehogs (atelerix albiventris). J Small Exotic Animal med 2:21-28, 1992. Smith, A.J. : Medical management of hedgehogs. Proc. 21st Waltham/OSU Syymp., Waltham USA, Inc., Vernon, Calif., 1997; pp57-61. Smith, AJ: Neonatology of the hedgehog (atelerix albiventris). J Small exotic Anim Med 3:15, 1995. Stocker, L.: Medication for Use in the Treatment of Hedgehogs. Marshcliff, Ayelbury, U.K., 1992. Tappe, J.P. et al. : Systemic Mycobacterium marinum infection in a European hedgehog. JaVMA 183 (11):1280-1281. 1983. Verlander, JW. : renal physiology. Textbook of Veterinary Physiology (J.D. Cunningham, ed.) W.B. Saunders, Philadelphia, Pa., 1992; pp489-529. Wrobel, D.: African hedgehogs: Breeding colony health issues. Proc. 5th Annu. West. Exotic Zoo Anim. Med. Conf., Madison, Wis., 1996; pp 103-107.